What does a Roman Soldier, a Yemeni headdress, and the Bride of Christ have in common? Do gems, silk and honey have something to say together? What if the message of eternity was found in antiquity? Marilynn Dawson, author of “Becoming the Bride of Christ: A Personal Journey”, “Mom’s Little Black Book: Godly Advice for the High School Graduate” and “Practical Thoughts on Becoming an Author” releases her next book, “Dressed for Eternity” in February 2014. Through practical research into down-to-earth materials, history and workmanship, Marilynn draws some interesting parallels to character God longs to see in the Bride of Christ. Lovers of history, archaeology, fine jewelry, fine food, bridal attire, fashon, and faith are invited to join her as she makes forays into Egypt, Yemen, Canaan, Rome and ultimately, the New Jerusalem. Writing in the devotional or Scripturally exploratory manner allows for diving into the Scriptures in a manner that invites the reader into the adventure. God has given you the desire to write, so write. Be open to constructive criticism. Be willing to learn and hone your skills. Your story will come out, and then you will see your own name in print. Marilynn grew up in a solid Christian home, coming to Christ at the age of 7. She has been actively involved in Church life since age 10, including activities such as joining her Mom and sister in singing special numbers, choir, teaching Sunday School, leading Sunday School open session, planning Sunday School lessons, and more. Marilynn attended both public and Christian private schools growing up. She attended North Island Community College on Vancouver Island and Trend College in Kelowna, BC, obtaining certificates in receptionist work and CompTIA A+ computer repair. Throughout her life, Marilynn has written poetry and published a few of them in the American Poetry Anthology(two issues). She’s also written numerous unpublished articles on end-time eschatology and the news, written unpublished short stories, word studies and more. 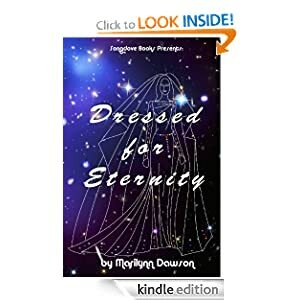 For more information about “Dressed for Eternity”, please visit https://www.facebook.com/Marilynn.Dawson.Author or contact Marilynn Dawson at 1-250-869-8429 or send an email to author@fa-ct.com. Click here: http://songdove.fa-ct.com/stuff/DFEpresskit.zip to download the press kit containing an image of the book, author photo, bookmarks, sample section, etc. This kit will grow, so check it once in a while for interviews, guest appearances, and to learn about more locations where the book may be found.